This podcast focuses on the dynamic aviatrix Bessie Coleman. Bessie Coleman was a pioneer in the field of aviation, not only as an African-American, but also as a woman. 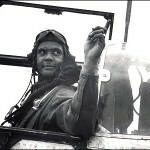 Unable to find training as a pilot in the United States, she went to France and return as the world’s first Black female pilot and soon began a career as a daredevil stunt pilot.Though she continued to struggle, she found other avenues to reach the public including the lecture circuit. She would not sell herself out, however, and walked away from a starring role in a motion picture which she thought was demeaning. Her tragic death shocked the aviation world but cemented her in the annals of flight. Take a look at our Bessie Coleman profile.